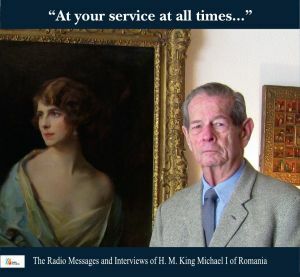 The volume contains two CDs with radio messages of H.M. King Michael I of Romania to the nation, broadcast between 1989 and 2011, and a series of interviews (2009-2009), conducted by two reputable journalists of Radio Romania: Mariana Conovici and Denise Theodoru. ”Forced into exile for half a century, King Michael remained unwaveringly loyal to the Romanians and conducted himself as such. Reading the messages he addressed to them over the airwaves and listening to the conversations he had with the editors of Radio Broadcasting in 2008 and 2009, you cannot help but be impressed by the extent to which His Majesty feels and comports himself as a Romanian. At the same time, in words as simple as they are spontaneous, demonstrating how close he is to the Romanian language, the King gives us lessons in history. He does so directly, sincerely, narrating crucial moments in his life, but which, given the position he held, are pages of our past, the history of all of us, recounted by the man who was Romania’s head of state for ten years.“ – writes the Academician Dan Berindei in the foreword to this volume. The photographs reproduced in this book are from the following sources: The Archive of the Romanian Royal House; The Radio Romania Archive; The Collections of the National Library of Romania; The Collections of the National Museum of the History of Romania; The AGERPRESS Agency. We invite you to listen to the message broadcast on 18 December 1989, recording made at the residence of H.M. King Michael I in Versoix (Switzerland) and broadcast on Radio Free Europe (Radio Romania Archive, Oral History collection). Cover: King Michael I next to the portrait of the Queen Mother Elena by Philip de László at his residence in Aubonne on the occasion of the recording of the “Famous Signatures” broadcast realised by Denise Theodoru on 17 February 2008 (detail). Recordings from the Radio Romania Archive, broadcast on Radio Free Europe (tracks 1, 2), Radio Romania (tracks 3-6); interview conducted by Mariana Conovici (track 7). Radio Romania recordings; interviews conducted by Mariana Conovici (track 1), Denise Theodoru (tracks 2, 3).